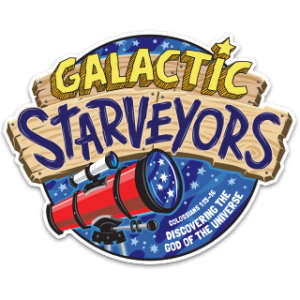 MUSIC: Like all VBS programs these days, Galactic Starveyors comes with an awesome collection of upbeat new songs and re-imagined versions of favorite hymns and praise songs along with plenty of choreographed dance moves. BUT it’s been a long time since we’ve heard such a catchy and bouncy theme song as “Galactic Starveyors.” Seriously. If the afternoon drowsies hit our office, we pump up the song and banish the blues! It’s techno beat and astro-inspired instrumentation is sure to get the most participation-shy 4th grade boy tapping his toes… at least! Funny Story: When we first heard the song “Galactic Starveyors” here in the office, we had a hard time figuring out the last line of the chorus. Our team took turns guessing what it says – Praise the All-of-Us Maker? Praise the One and the Maker? The Omnibus Maker? Then Andy popped his head in. In one listen he got it. “Praise the Universe Maker!! !” Of course! The Heavens Declare the Work of the LORD! BIBLE POINT: For a theme that focuses it’s lens on the vast loneliness of space, Galactic Starveyors sure talks a lot about relationship. LifeWay boils down the whole universe into the beautiful story God has been telling for eternity; that He created it all as the vehicle for relationship with you and me. On Day 1, “The Relationship Began,” kids learn about the universe God created, from the biggest galaxy to the tiniest cell. Day 2, “The Relationship Broken,” introduces the results of sin and the precarious position we are now in because of the fall. “The Restoration Promised” on Day 3 sparks hope through the prophecy and birth of “God with Us,” a Savior, born to save us from our sin. On Day 4, “The Relationship Restored,” kids learn about Jesus sacrificial death and resurrection, the Gospel, the key to restored relationship with God. And finally, Day 5, “The Relationship Continues” launches kids into a new life of ongoing transformation and evangelism, sharing the good news with others. It’s a great big universe, with a great big story, that results in a great big relationship with the God who created it all! 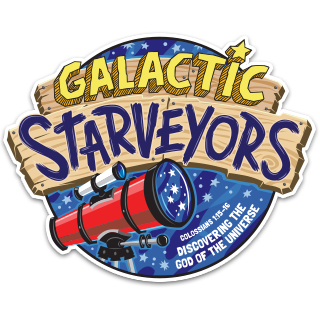 SKITS: For your kids, one of the most exciting parts of the morning worship rally will be the Galactic Starveyors adventure film. This daily serial follows Landon and his friends as they use their smarts, creativity, and some pretty awesome homemade inventions, to save Landon’s dad, an astronaut stranded in space on a botched mission to Mars. The four friends, a kind of space-age group of “Goonies,” blast off into an incredible adventure which eventually leads them to trusting the God who made them and the vast universe they seek to explore. Some students, especially those who may have lost a parent, might find the story a little distressing. The filming locations, sets, and special effects are world class – very impressive! Your VBS kids will love the wild ride as the story unfolds day by day. SETS & PROPS: Your volunteers are going to love building the sets for Galactic Starveyors! Starry skies, planets, comets, and galaxies all make beautiful and exciting set pieces that are relatively easy to recreate. The story line includes a kids’ clubhouse either in a suburban back yard or on the rooftop of a city building with a prominent telescope that brings all the celestial bodies close enough to see. Your lighting tech will have a field day coloring your dark backdrops with the blues, purples, and greens of deep space. From the inside the clubhouse, the windows give set designers a fun way to trick the eye into really believing they open to the sky. Watch the “Decorating Galactic Starveyors” prep videos for some awesome tips for turning your stage into a beautiful, star-filled set. PRO-TIP: When painting stars on your backdrop, or placing lights to recreate a night sky, keep this one word in mind – Random. In order to keep a realistic look, steer clear of making any pattern with the placement of your stars. If you start making rows and columns with your stars, the pattern will be obvious and the effect of the sky will start to resemble a checkerboard rather than the beautifully complex universe God set in the sky. Also, there’s an old artist’s trick that helps keep a random look in drawings and paintings. Always place clusters of stars in odd numbers, and most often in clusters of 3. For some reason, the human eye doesn’t see patterns in threes as easily as it does in fours. Takin’ It Home – We love these CDs that keep the message and conversations started at VBS going on the car ride home. Each day has 3 tracks of extra content to help Moms and Dads build upon what your team began that morning. Missions Under the Stars – Missions moments often focus on the recipients of missionary work, especially the poor and suffering. The twist here is that your kids get to hear true stories from the kids of missionaries, which we think really helps kids relate to the great commission. Starveyors Clubhouse – Some kids have difficulty relating with larger groups, so the Starveyors Clubhouse, a breakout discussion session, offers the perfect opportunity to build relationships with the less-outgoing kids. Purchase your copy of Galactic Starveyors from LifeWay HERE.